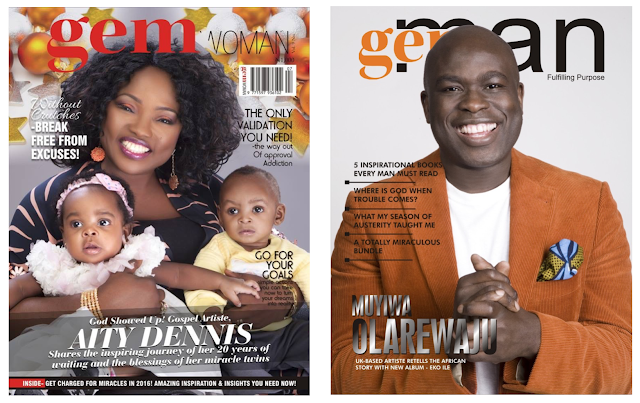 gemWOMAN/gemMAN Magazine has released its most inspirational edition as the perfect companion this Christmas. The edition features Gospel Artistes, Aity Dennis on the cover of gemWOMAN and UK-based Gospel artiste, Muyiwa Olarewaju on the cover of gemMAN with remarkable stories to lift the heart of anyone facing seemingly overwhelming odds. If you’ve ever been confronted by an insurmountable ‘mountain’- situations that seem not to go away, regardless of how long and hard you’ve hoped, prayed, praised, waited, trusted and exercised faith; then maybe you’ve walked a mile in Aity Dennis shoes. Pastor Aity Dennis’ story is a remarkable one that would leave you in awe of the faithfulness of God, for He alone could have done this - the miraculous conception and delivery of a healthy set of twins four years after menopause and after over 20 years of waiting. Muyiwa also shares on his amazing journey to becoming one of the top Gospel acts in the United Kindgom and his seventh album, Eko Ile. These aren’t just interviews, but testaments to the faithfulness of God – His ability to turn impossibility to possibility, His miracle-working power able to overturn, restore and replenish! And it is brought to you at such a time as this to reignite the embers of faith within you, to inspire you to hope again and release your expectations to receive the fulfilment of the unfailing promise of God. Be inspired by their testimonies, and dare to believe for yours!